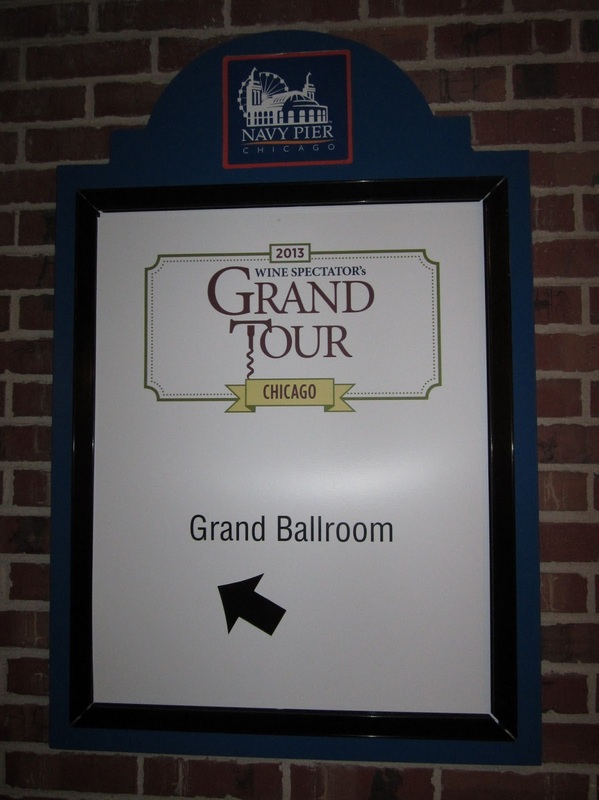 After stops in San Francisco and Las Vegas, Wine Spectator's 2013 Grand Tour came to a close in Chicago this past Friday. 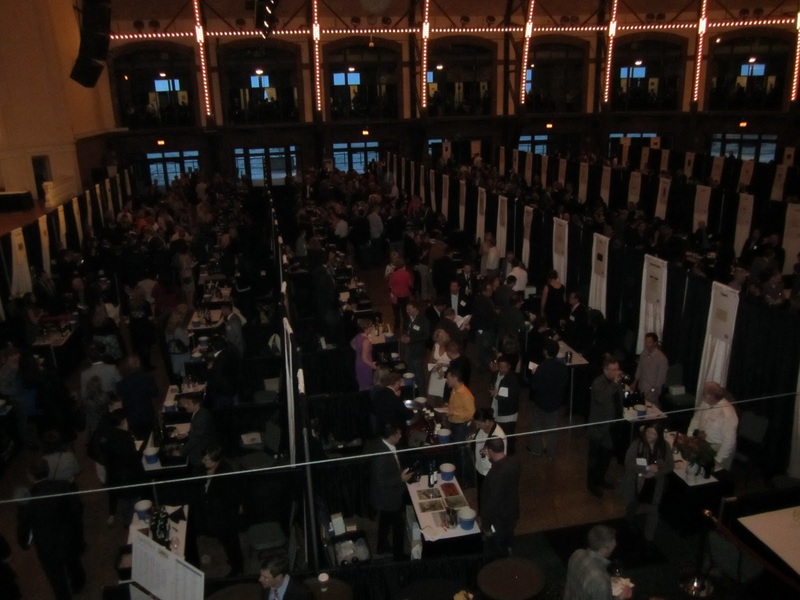 200+ wineries hand picked by the maganize's editors for their pedigree of outstanding ratings were on hand, each pouring one of their signature wines. The event includes a 3 hour walk around tasting of top-scoring wines, a light buffet that's enough to make a meal out of, and a souvenir Riedel wine glass. The event is truly an embarrassment of riches. This was the second Grand Tour I've attended and just as with the first I found myself in stretches where I was pouring out epic $200+ wines just to clear way for the next amazing wine. As an attendee there are just too many must-try wines to tackle in a single night. The best you can do is indulge and enjoy until your palate is shot. If you've never been to Navy Pier before it's kind of like an indoor Fisherman's Wharf or Faneiul Hall kind of place. We didn't realize the Spectator event was on the far end of the pier or we may have had the cab drop us off there. 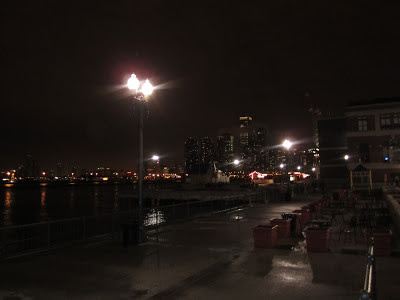 But we had time to spare so we enjoyed walking through Navy Pier, mingling with kids on their way to their high school proms. It was quite a scene - kids today! We arrived at about 6:30 for the 7:00 pm event and a formidable line had already formed. Security did a great job controlling things throughout the night. Not that the "rowdies" at a Spectator event are hard to control, but they were quite courteous. For example, after we got our tickets from Will Call we technically should have gotten back in the entry queue to get wrist bands. But a kind security guard spared us the line and retrieved wrist bands for us. Nice! But I started to have concerns this would be a crowded event with lines forming around the marquee wines. One thing I loved about the Boston Grand Tour in 2011 was the moderate crowd levels. You could walk around and taste most any wine with hardly a wait. 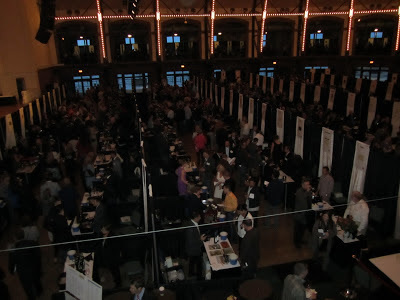 Would this event be more like The Boston Wine Expo which is notorious for having long lines at each table? While waiting in line we chatted with a nice couple from Michigan so time flew by. 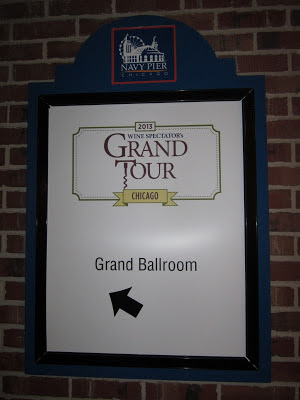 We were inside the Grand Ballroom before we knew it. We made a beeline for the California Pinot Noirs. We started with the 2010 MacPhail Pratt Vineyards Pinot Noir. I'd never tried MacPhail before but have wanted to ever since Belle Glos winemaker Joe Wagner mentioned them as one of his personal favorites. The MacPhail was bursting with flavor; a very satisfying wine. 90WS/$49 retail. Next to MacPhail was a Flowers Pinot Noir- the 2010 Flowers Sea View Ridge Block 20. I thought the de-emphasis of Flowers in the front label in favor of a more prominent mention of the vineyard was an interesting play. The wine is very elegant and delicious. 91WS/$75 retail. Siduri was on hand pouring their 2011 Siduri Pisoni Vineyard Pinot Noir. I didn't try that but wish I had. I bet that was a winner. But I did try the 2011 Belle Glos Las Alturas Pinot Noir. I've had this wine many times across the last few vintages and it has been so reliably delicious. I asked the assistant winemaker, who was pouring the wine, how they achieved that distinctive slight sweetness in their Pinot Noir in general and the Las Alturas' flavor profile specifically. He described how they let the grapes start to shrivel just a bit on the vine (a technique which Belle Glos' parent company Caymus employs on their Cabernets as well) but before the grapes lose hydration. It sounds like a recipe for over-ripeness but I have never once gotten a raisiny or pruney note in any of their Pinots. Not one has been overripe. Their wines are so plush it's hard not to like them. Spectator hasn't rated the 2011 yet but the past two vintages scored 92 points. Around $44. Tasting the Las Alturas served as a nice calibration mechanism. But before we got too carried away we thought it would be good to get some food. We were considering going out to dinner before but I'm glad we didn't. That would have made us late and there was plenty of food to be had. Pastas, paninis, cheese, crackers and bread along with an array of desserts and coffee. A quick bite to eat and we were back in the game. Some of the wineries were set up on a half-circle on the second level of the venue. We settled in for quite a stretch: Joseph Phelps Insignia, Cos d'Estournel, Pontet-Canet and more all lined up in a row. I remember trying the Phelps Insignia at the event in Boston. It was amazing. I remember thinking to myself that if I ever saw a deal on it I'd go for it as a splurge. At $200 it's a tough price point to get behind - but a great wine to taste at an event like this. 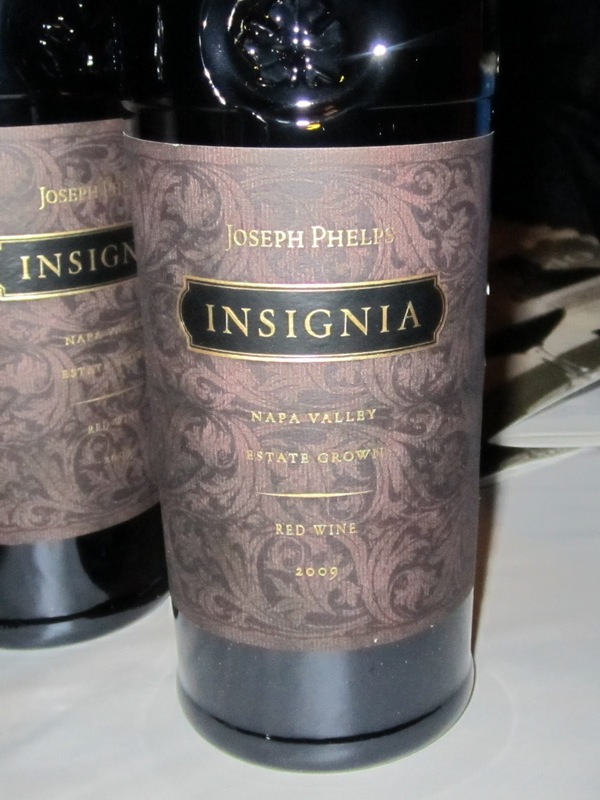 Strangely though, the 2009 Insignia was a tannic beast and not nearly as enjoyable as I recall the 2006. Not that it won't settle down but I wasn't immediately drawn to this vintage. 91WS/$200. The 2008 Cos d'Estournel I tried immediately after was eye opening. One tip I picked up from the gentleman pouring Chateau Palmer at the Boston event was that when you're buying Bordeaux for enjoyment, buy in the "off" vintages. In Bordeaux, 2005, 2009 and 2010 are the recent ones with substantial hype. 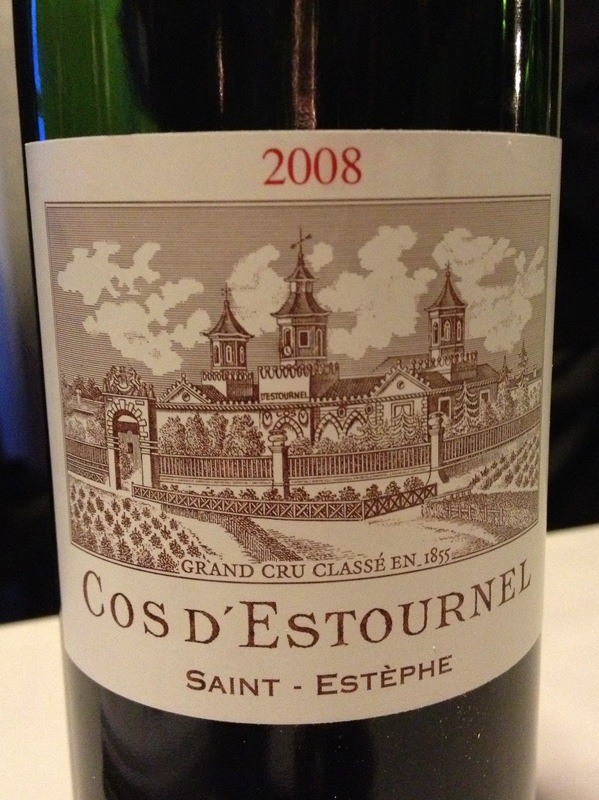 The 2008 Cos d'Estournel was charming on the nose and elegantly satisfying on the palate. 90WS/$135. Just as I'm having a debate in my mind about the Bordeaux value proposition, I see Wine Spectator Senior Editor James Molesworth. He covers Bordeaux, The Rhone Valley and more for the magazine so he's the perfect guy to help me relate to what I just tasted. I explain my theory about buying Bordeaux for consumption in off vintages, how fantastic I thought the '08 Cos d'Estournel was (his official tasting notes for the wine call it "quite juicy" which may explain why I liked it), and how '09 and '10 Bordeaux is so expensive that I haven't considered buying much of it. 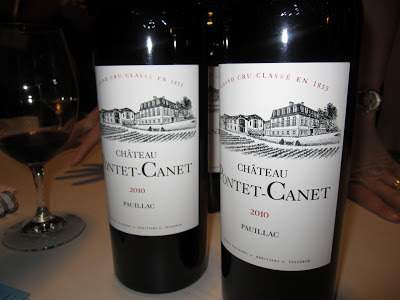 Fresh off the conversation about Bordeaux vintages was a taste of a great one: The 2010 Pontet-Canet. 97WS/$210 - it was an elegant, refined wine. I tried the 2008 Pontet-Canet at the Boston event and the 2008 was quite a bit more fruit forward and ready to go. The 2010 needs time. I'm always torn at events like these whether to spend time tasting new vintages of marquee wines -or- explore more off the beaten path wines. As much as I'd like to take the opportunity to learn, I'm a sucker for certain wines and it's hard to pass up a chance to taste wines like Caymus Special Selection. The 2010 was just rated 96 points by Wine Spectator and retails for $130. The wine is amazing. Whereas the 2009 was so comically fruity it was almost a non-wine, the 2010 recovers nicely and sticks a near perfect landing. Plush fruit amply backed by supporting mocha notes make it extremely enjoyable. 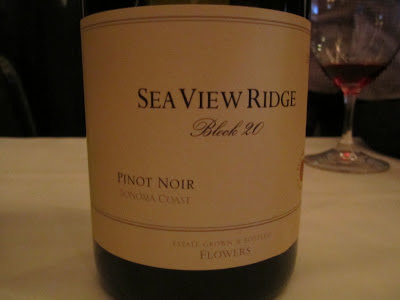 It's not at all off the beaten path but for sheer enjoyment this was probably my wine of the night. A couple of Aussie Shiraz showed nicely: The 2011 Mollydooker Carnival of Love and the 2010 Glaetzer Bishop. The Bishop vineyard is, according to the gentleman pouring it, situated right next to the more famous/expensive Amon Ra vineyard so if you like the Amon Ra the Bishop might be a nice value play. 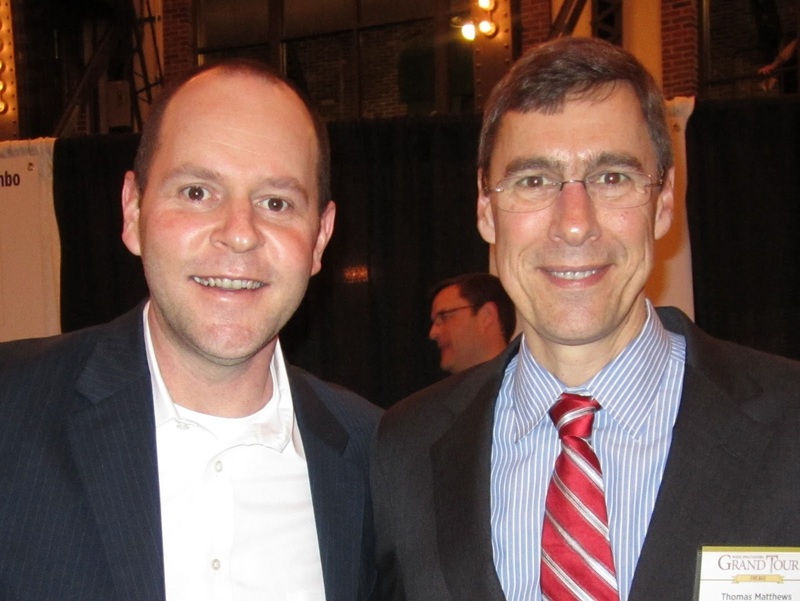 Just when I thought I'd miss him, I spotted Wine Spectator Executive Editor Thomas Matthews. In addition to running the magazine, he reviews Spanish wines so I picked his brain about that category a bit. 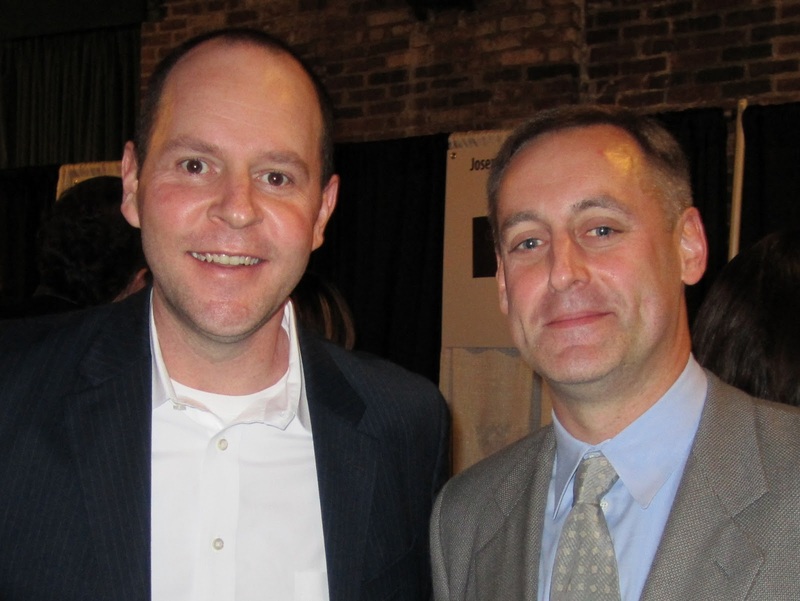 I asked him about the 2011 Boston Grand Tour event, whether it was poorly attended and whether they'll ever bring the Grand Tour back here. He said that yes, attendance at Boston wasn't spectacular, but I got the sense they're willing to try new venues every few years. Matthews is a true gentleman and it was a pleasure meeting him. One more wine: The 2010 Alto Moncayo Garnacha. Just like the Betts & Scholl Grenache wowed me at the Boston event, I thought this Grenache-based wine was fantastic. 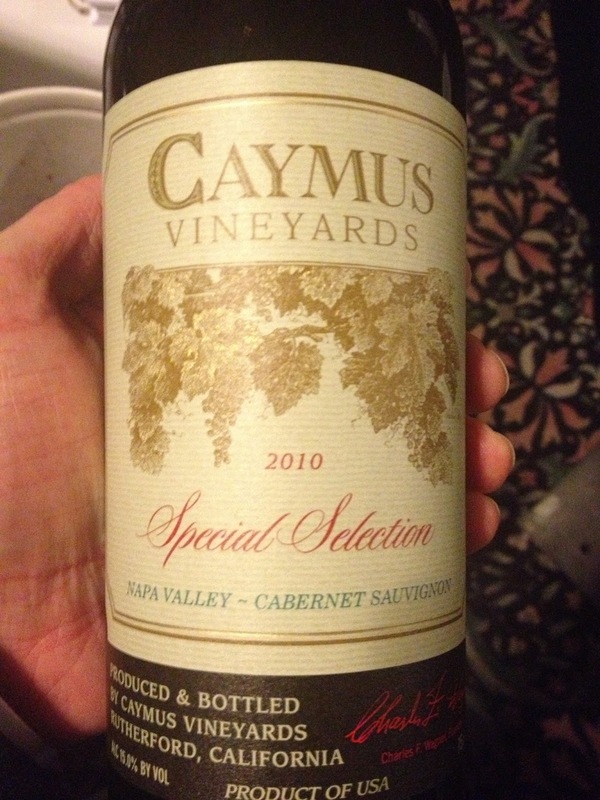 The 2010 hasn't been rated by Spectator yet but the 2009 got 93 points and retails for $45. You can find the 2010 in the $30s and I think it's a tremendous value at that price. The only problem is you can find great Grenache under $15. Heck, under $7! But I think the Alto Moncayo is worth a shot if you've enjoyed more affordable Grenache. The 2010 is gorgeous. I was thinking of how to explain the quality of the lineup at this event in a way that anyone would understand it - even if they're not into wine. Take an experiential hobby and lay out all of the benchmark experiences in a row and try them one after another back to back. It's like taking the best paintings from Van Gogh, Monet, and Picasso and lining them up in one place for you to experience. Like having Thomas Keller and Eric Ripert present their best dishes to you. Like driving an M5, an S6 and E63 AMG back to back. Like playing Augusta and Pebble Beach in the same weekend. I recall an interesting piece from W Blake Gray about how there are 2 types of premium wine consumers in the US: The Prestige consumer and the Intrigue consumer. Labels and brands are important to the Prestige consumer. I consider myself a Prestige consumer. The reason I'm a Prestige consumer is because I'm interested in experiencing benchmark wines to give myself a relatable frame of reference for comparing other wines I try. The next opportunity to take in an event like this is October 24-26, 2013 in New York.That events features 2 evenings of walk around tastings like the ones on the Grand Tour plus sit down seminars moderated by Spectator editors including a tasting of the year's Top Ten wines each presented by the winemakers. You can attend just the grand tastings, either evening. Who's in? Although it would be great to have one of these in Boston (or wherever your hometown might be) I thoroughly enjoyed doing it as an overnight trip. Usually when we go for a night out, the kids are raring to go first thing in the morning and we're dog tired. Not the case when you wake up in a hotel bed! Keep that in mind next time one of these roll around and getting there involves a bit of a trip. Disclosure: Complimentary admission on a media pass. 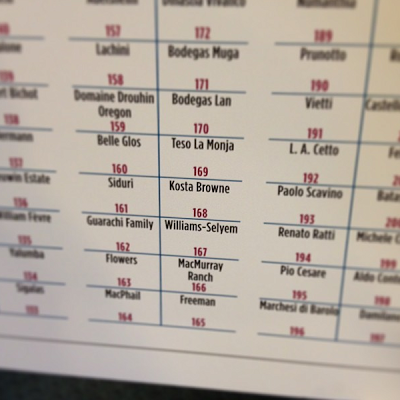 Question of the Day: Have you been to any Wine Spectator events? If so, what did you think?